While we must eat to live, I live to eat! Of course, food is something that can be eaten alone or shared with others, but the best part is being able to masterfully create recipes on your own and chow down. This month I decided to share just a sample of my favorite wild game and fish preparations. 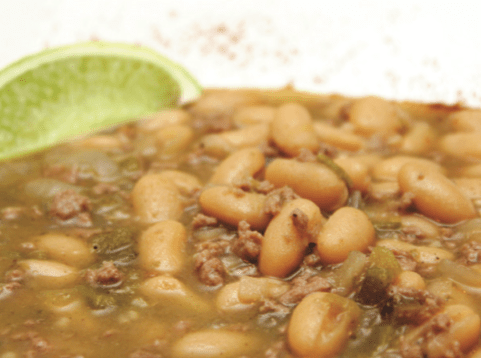 There are many more, but these make my mouth water and are very easy to make – you just have to have some wild game in the freezer to make them too. Let’s get cookin’! You can start with jalapenos for a spicier popper, or if you are in the company of others who do not like spicy, start with a sweet pepper and kick in the flavors you want later. I have made both, and they both rock, but for this recipe I used the sweeter peppers. I always do this to taste. I don’t want to overpower the entire appetizer, so I add just enough vinegar to coat the meat, add a few sprinkles of garlic salt and cover. Set them in the refrigerator for at least an hour, but overnight is best. Cut the peppers in half and remove the seeds. In a small bowl, mix the cream cheese and brown sugar. Fill each pepper with the mixture. Lay a strip of venison the length of each pepper. Take your pound of bacon and cut the layered strips in half. 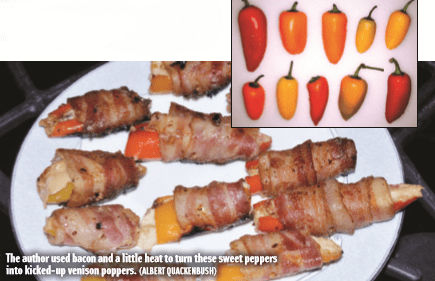 Wrap each pepper in a half strip of bacon, then skewer it to keep the bacon in place. I try to get five or six peppers on each skewer, but no more. You want to be able to grab each wooden skewer from both ends. I use wooden skewers so as not to burn my fingers. The peppers are naturally sweet, so these might need a kick. I like to sprinkle some crushed red pepper over the top of the bacon right before I put it on the grill. Set all the skewers on a piece of aluminum foil. This will help block flare up from the bacon grease as they cook. Fire up one side of the grill (or barbecue) to 300 degrees. On the opposite side, put down the foil-protected poppers. Now it’s a waiting game. The indirect heat will help the venison cook through and the bacon to crisp up. Once the bacon is crisp, remove the poppers and serve! This dish feeds three to four people, depending on how hungry you or your friends are. Wild turkey is tasty and versatile game meat. If you aren’t sure what to do with the meat, one of the easiest things to do is remove it from the bone and grind or finely chop it up. From meatloaf to enchilada filling to burgers on the grill (for great burgers that hold up on the grill, mix the turkey meat with ground pork), there are a lot of options. Once the meat has been removed, don’t toss that carcass. Homemade stock is amazing and will turn ordinary chili or turkey soup into a fabulously flavorful creation. In a large pot, sauté the onion and garlic in olive oil on medium heat, two to three minutes. Add turkey and seasonings, sautéing an additional five minutes. Add remaining ingredients, except lime juice, and simmer at least 30 minutes. Remove from heat, add lime juice and serve. Separate turkey pieces so they will fit in a large stockpot. Quarter onion and roughly chop carrots and celery. Peel garlic and bruise with a mallet. Add ingredients to stockpot and fill with water. Bring ingredients to a boil then reduce to a simmer. Simmer over medium-low heat six to eight hours. Salt and pepper to taste. Strain broth and discard bones and vegetables. Refrigerate for up to four days or freeze for long-term storage. Editor’s note: For signed copies of Tiffany Haugen’s popular cookbook, Cooking Game Birds, send a check for $20 (free S&H) to Haugen Enterprises, P.O. Box 275, Walterville, OR 97489, or order online at scotthaugen.com. YOU CAN HAVE YOUR CAKE . . .
Winter steelhead is a mild meat and it nicely takes on the flavors of what it’s cooked with. While this recipe tastes great with a fresh fish, even if you have a whole steelhead in the freezer, it will turn out great. This recipe was a discovery from leftover crab cake filling; now when making crab cakes, I always make enough for stuffing fish the next day. low heat for 20 to 30 minutes or until fish tests done (140 degrees). Or bake in a preheated oven at 400 degrees, leaving 10 minutes per inch of thickness, including stuffing. 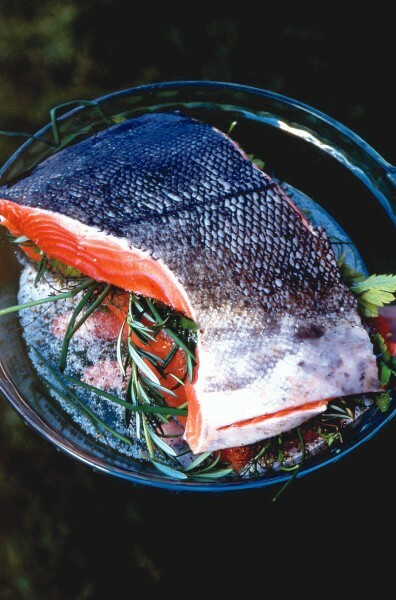 *To remove the bones from an already gutted steelhead prior to cooking, place it on its back. From the inside of the fish, cut the ribs where they attach on to the spine. Sever the ribs on both sides of the backbone, continuing through the pin bones but taking special care not to cut through the skin. Cut through the spine at the base of the head and at the base of tail, and then pull the entire spine out. Next, carefully fillet the rib bones away from the meat, leaving all the meat you can on the fish. Trim excessive fat and fins off the belly of the fish. To remove the pin bones, find them by running your fingers from head to tail. This will get the bones standing up, which makes them easy to remove with a small set of pliers or special tweezers. You now have a boned steelhead. Editor’s note: For signed copies of Tiffany Haugen’s popular cookbook, Cooking Salmon & Steelhead, send a check for $25 (free S&H) to Haugen Enterprises, P.O. Box 275, Walterville, OR 97489, or visit tiffanyhaugen.com. Wild pig is one of our family’s favorite game animals come dinnertime. Because hog meat is mild, it easily takes on the flavors it’s cooked in; thus, it can easily be prepared in many ways. Known also as nopalitos and pork, this unique dish is a great way to introduce your family to something new. The nopalitos, or prickly pear cactus (paddles), can be found in specialty food stores and many grocery stores. dish in the slow cooker, brown meat with onions and garlic, add remaining ingredients and cook on low four to five hours, or until wild boar is tender. cookbook, Cooking Big Game, send a check for $20 (free S&H) to Haugen Enterprises, P.O. Box 275, Walterville, OR 97489 or order online at scotthaugen. com. This book offers more than 100 great recipes. For years, I kept my game off the grill. Trying to cook an elk steak the way I grew up grilling a beef T-bone never yielded good results.Once I started plank cooking, the grill started staying out year-round and everything went on it. 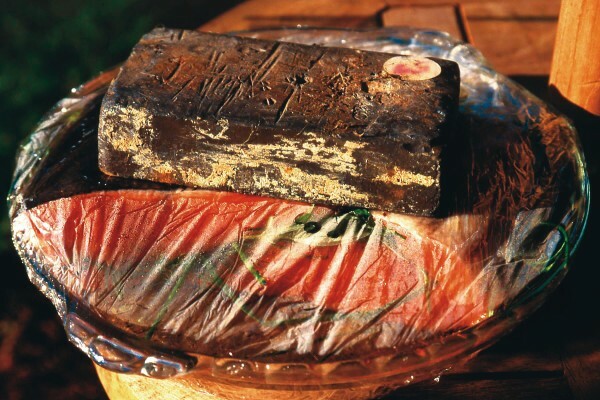 Because planks help keep moisture in fish and game meat, they fix the problem of lean meat drying out and either tasting like shoe leather or falling through the grill. Planks also keep the grill clean and make a great serving platter/cutting board. When we still wanted to perfect grilled venison steaks and backstrap, practice eventually made perfect. There are only a few guidelines to follow when grilling lean game meats such as elk, deer, antelope and turkey. 1. For steaks, slice meat thinly (half an inch) across the grain if grilling backstrap or tenderloin. Pound and/or tenderize other meat cuts into steak-size portions. For whole backstraps, simply cut to a manageable size and trim off any silverskin. 2. Marinate meat in an oil-based marinade. One of the most convenient is Italian dressing (do not use low- or no-fat dressings). 3. Keep salt to a minimum, as it can make meat tough. Try a sprinkling of sea salt while meat is grilling. 4. Keep grates well lubricated. Use an oil-soaked paper towel held by tongs to wipe grates down right before placing the meat. 5. Let meat reach room temperature before grilling. Cold meat sticks to grill grates and contracts and becomes tough. 6. Grill the meat hot and fast. Get grill temperature to at least 400 degrees, grill the first side only until grill marks appear and then turn meat with tongs. By the time the last of the meat is flipped, the first ones you flipped will be done. For backstrap, move the meat as needed to keep heat even. 7. Do not overcook. It is safe to eat most red meat rare – bear, boar and cougar being the exception. Cook backstrap to an internal temperature of 140 degrees. After a day of striper fishing, nothing beats a good fish fry. Cut into small pieces, chunks of striper meat coat nicely with batter or a dip in egg/flour/breadcrumbs and fry up very quickly; the result yields a sweet, moist, tender treat. As tasty as fried stripers (or any white-meated fish) may be, however, there are alternative cooking methods for these versatile bass. Fish is one of the healthiest proteins, and in order to keep the whole meal healthy, try steam-baking your next batch of stripers in parchment paper or foil. In the oven or on the grill, cooking fish in sealed packets locks in moisture and infuses flavor throughout the meat. With individual portions prepared this way, serving and cleanup are a breeze. When filleting stripers or any fish caught in warm water, remove all bones and skin from the meat. Rinse away any slime or scales, prior to cooking. • Place fish chunks/fillets in the center of parchment paper or foil. • Season with salt, pepper and garlic powder. • Top with remaining ingredients. • Fold parchment paper or foil, sealing all edges. • Bake in a preheated 350-degree oven or on a medium-hot grill for 10 minutes. • Garnish with Parmesan cheese if desired. Editor’s note: For signed copies of Tiffany’s latest book, Cooking Seafood, send a check for $20 (free S&H), to Haugen Enterprises, P.O. Box 275, Walterville, OR 97489. This and other cookbooks can also be ordered at tiffanyhaugen.com. Tiffany Haugen is a full-time author and part of the new online series, Cook With Cabela’s. Also, watch for her on The Sporting Chef on the Sportsman Channel. Follow her on Instragram, Facebook and Twitter. Tired of eating trout the same old way? Here’s a fun, innovative way to bake them, and not only is this method easy, it produces a deliciously steamed, moist flavorful fish. Salt crusting will work with any whole fish; try it with a fresh-caught cutthroat, kokanee or small steelhead, or get into the freezer and use up what you caught over the winter. For best results, use kosher salt. The amount of salt will vary for the size of the fish. The key with the salt crust is getting the salt moist enough with egg white and water to form around the fish without falling apart. Additional flavorings are endless, as the cavity of the fish can be stuffed with any herbs, citrus slices, garlic and/or ginger. In a large bowl, mix salt and egg whites until moistened. Add enough water for the salt mixture to stick together. Rinse and pat cleaned fish dry, inside and out. Divide herbs and citrus slices evenly among fish. Brush both sides of fish with a light coating of olive oil. On a large baking sheet, spread a layer of the salt mixture about .-inch thick for the fish to lay on. 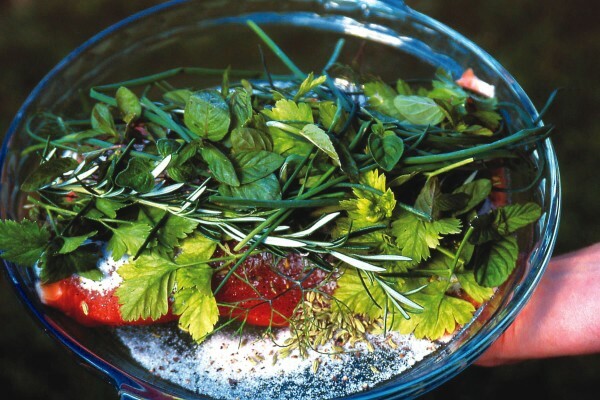 If you have additional herbs, put a single layer of leaves on the salt, right where the fish will sit. Lay stuffed fish on top of the salt or herb layer on the baking sheet. Mound the rest of the salt mixture on the fish and cover completely. Pack the salt down evenly and try to keep the shape of the fish intact. If there isn’t enough salt to completely cover the fish, it is fine to leave the head and/or tail exposed. Bake fish in a preheated, 400-degree oven for 25 to 30 minutes or until fish reaches an internal temperature of 135 to 140 degrees. If using an oven-safe thermometer, insert probe before baking so the salt crust doesn’t crack when checking the temperature. Let fish sit five to 10 minutes before cracking the crust and removing. Skin should lift easily off the fish. Remove fish fillets from the salt crust prior to serving. With summer arriving this month, now is a great time to clean the freezer and make room for this coming fall’s influx of fresh meat. Don’t be guilty of shoving last season’s birds to the back of the freezer and then forgetting about them. There are many ways to prepare game birds, and specialized approaches can be tailored for each species. However, in an effort to keep things simple yet tasty, the following recipe was created with all game birds in mind. These bite-sized tidbits – or bigger finger foods – are a delicious way to introduce people to game birds. To double the batch, add 2 cups cooked brown rice to the meat mixture, doubling the amounts of oyster or soy sauce as well. Heat oil in a large skillet and brown meat on medium heat. Add garlic, water chestnuts, sauces and sugar and sauté an additional two to three minutes. Remove from heat and mix in green onions and sesame seeds. Separate lettuce leaves (butter, Boston, iceberg or leaf lettuce all work well). Divide meat mixture evenly among lettuce leaves. Or serve a portion of bird mixture with leaves on the side, allowing people to make their own bite-sized wraps. Serve with soy sauce for dipping. What the heck is “tuna kama?” New filleting regulations for all tuna species caught in California waters require that the fillets must have the skin left on, and the fish’s “collar,” which includes the pectoral fin, be included in the bag together in order to allow enforcement personnel to easily determine species. For decades before this, deckhands have simply been discarding these collars as waste, often just tossing them overboard and saving only the prime fillet. As it turns out, we should have been saving them all along, as the collar section, or kama, is highly desired by chefs around the world. If these bloggers are correct, a lot of folks are going to be experiencing the meal of a lifetime this year! extolling the virtues of specialized extra-heavy tackle for chasing “cow” grade yellowfin tuna – those over 200 pounds – aboard San Diego-based long-range boats. The reality is that cow-size tuna are virtually never caught on trips shorter than 10 days’ duration. From now until the end of October, most long-range boats will be running trips between three and eight days in length. The outline below lists the most commonly recommended rod/reel combos for eight-day trips. Good loaner/rental packages are available from the boat or sportfish landings for first-timers, and new long-rangers can ease slowly into the obsessive tackle collecting that grips a large number of practitioners. For trips of five days’ duration or less, the heaviest combo (No. 5 below) will most likely not be needed, though you can never tell for certain. On most boats, trolling tackle and “kite” tackle can be borrowed from the boat when it’s your turn. 80- to 100-pound live bait combo Reel: PENN International 2-speed 16VSX, or 30VSX Rod: Conventional 5½- to 7 footers, such as PENN CARBW760H, rated for 50- to 130-pound lines Applications: Larger-grade tuna to 200 pounds or more; heavy-duty dropper looping CSEditor’s note: The author loves hearing from California Sportsman readers and can be reached at scarson@sunset.net. Cut a section of a whole fish that can be matched to fit on top of each other for this method of preservation. Lay one fillet skin side down in a glass baking dish. Sprinkle half of the salt, sugar and pepper mixture over fillet. Lay all of the herbs on top of fillet. Sprinkle the remaining salt, sugar and pepper mixture over the second fillet. Place the second fillet atop the first fillet – the thicker section on top of the thinner section – sandwiching the herbs between the two. Cover with plastic wrap and weigh down with a heavy object. We use a lead ingot for a weight, as it fits well in the refrigerator. Turn the “fish sandwich” every 12 hours for 48 hours. After fish has cured, slice meat diagonally off skin. 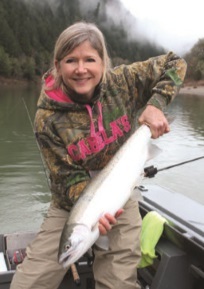 Editor’s note: For personally signed copies of Tiffany Haugen’s popular book, Cooking Salmon & Steelhead, send a check for $25 (free S&H) to Haugen Enterprises, P.O. Box 275, Walterville, OR 97489 or order online at scotthaugen.com. Tiffany Haugen is a full-time author and part of the new online series, Cook With Cabela’s. Also, watch for her on The Sporting Chef, on the Sportsman Channel. Follow her on Instagram, Facebook and Twitter.